For the 2014 film, see Getúlio (film). This name uses Portuguese naming customs. The first or maternal family name is Dornelles and the second or paternal family name is Vargas. 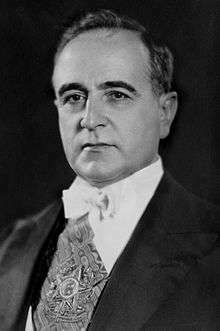 Getúlio Dornelles Vargas (Portuguese: [ʒeˈtulju doɾˈnɛlis ˈvaɾɡɐs]; 19 April 1882 – 24 August 1954) was President of Brazil, first as a Revolutionary leader (from 1930 to 1933) and after as an elected president. In 1937 he started the "Estado Novo" dictatorship that lasted till 1945. In 1951 he was democratically elected to a term from 1951 until his suicide in 1954. Vargas led Brazil for 18 years, the longest of any President, and second in Brazilian history only to Emperor Pedro II among heads of state. He favored nationalism, industrialization, centralization, social welfare and populism – for the latter, Vargas won the nickname "The Father of the Poor". He was a proponent of workers' rights as well as a staunch anti-communist. Vargas sought to transform Brazil from a plantation-based economy into an industrialized powerhouse under the guidance of the government intervention. His embrace of developmentalism was expressed not only in strong rhetoric, but also by lending protection to domestic industries and in a heavy investment budget aimed at kick-starting "strategic" sectors and setting up the necessary infrastructure. Vargas created state monopolies for oil (Petrobras), mining (Vale), steelmaking (National Siderurgy Company), alkalis (National Alkalis Company) and automobiles (National Motors Factory). His policies shaped the Brazilian economic debate for decades, from the governments of Juscelino Kubitschek and leftist João Goulart to the right-wing military dictatorship of 1964 to 1985. The protectionist trend was reversed by the 1990s with the liberal reforms of Fernando Collor de Mello and Fernando Henrique Cardoso. With the global rise of democracy in the aftermath of World War II, Vargas agreed to cede power in free elections, thus ending the Vargas Era. His popularity earned him a late presidential term, but mounting pressure and political strife over his methods led him to suicide. He was the first president in the country to draw widespread support from the masses and is regarded as the most influential Brazilian politician of the twentieth century. He had also been a lawyer and landowner who occupied the 37th chair of the Brazilian Academy of Letters from 1943 until his death in 1954. Photographed with his wife Darci Vargas in 1911, during the period known as the Brazilian Belle Époque. Vargas was born in São Borja, Rio Grande do Sul, southern Brazil, on 19 April 1882, to Manuel do Nascimento Vargas and Cândida Dornelles Vargas. His father had origins in São Paulo, being a descendant of early São Paulo families ("paulistas"): he was a descendant of Amador Bueno, a noted paulista from the colonial Brazilian era. His mother was descended from a wealthy family of Azorean Portuguese descent. The son of a traditional family of "gaúchos", he embarked on a military career at first, then turned to the study of law. Vargas enlisted as a private in 1899 in the sixth infantry battalion and later joined the military college at Rio Pardo. Vargas then turned to law school at Porto Alegre in the Rio Grande. During his time in law school Vargas published a political newspaper, O Debate. Vargas was the chosen orator in his graduating class of 1907 and was immediately appointed district attorney. In 1909 he opened his own law office in São Borja. Entering Republican politics, he was elected to the Legislative Assembly of Rio Grande do Sul and later to the federal Chamber of Deputies in 1922, where he became the floor leader for his state's delegation in Congress. He served as Finance Minister from 1926 to 1928 under President Washington Luís, from which post he resigned to enter the gubernatorial race in his home state. Once elected Governor of Rio Grande do Sul, he became a leading figure in the national opposition, urging the end of electoral corruption through the adoption of the universal and secret ballot. As Governor of Rio Grande do Sul he distinguished himself as an excellent administrator. During his term as governor he reorganized the agricultural system. He established a state mortgage and agricultural bank. He also created the department of agriculture in his state. Vargas also worked hard to improve schools and infrastructure during his term as governor. He and his wife Darcy Lima Sarmanho, whom he married in March 1911, had five children: Lutero, Alzira, Jandira, Manuel e Getulinho. According to legend, Vargas's real love was not his wife, but Aimee de Sa Sottomaior, later Aimée de Heeren, recognized by the international fashion press as one of the world's most glamorous and beautiful women. The relationship was a Brazilian state secret, although Vargas did mention her in his diary published after the death of his wife. Aimee de Herren, later living between France and the United States and admired by other famous statesmen such as the four Kennedy brothers, Joseph, John, Robert and Edward, never confirmed nor denied the rumor. Between the two World Wars, Brazil was a rapidly industrializing nation popularly regarded as "the sleeping giant of the Americas" and a potential world power. However, the oligarchic and decentralized confederation of the Old Republic, dominated by landed interests, in effect showed little concern for promoting industrialization, urbanization, and other broad interests of the new middle class. Bourgeois and military discontent, heightened by the Great Depression's impact on the Brazilian economy, led to a bloodless coup d'état on 24 October 1930 that ousted President Washington Luís and the president-elect Júlio Prestes. 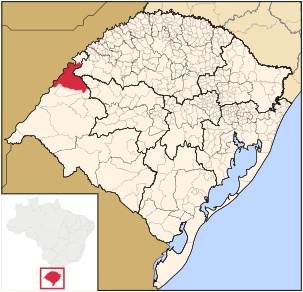 Regional leadership, dissatisfied with the state of São Paulo's political dominance, gathered around the states that formed the so-called Liberal Alliance – Minas Gerais, Paraíba and Rio Grande do Sul. They had backed Vargas, the defeated candidate in an electoral process that had been questioned and denounced as fraudulent by both sides, as was often the case in the period known as the Old Republic (1889–1930). Vargas's Liberal Alliance drew support from wide ranges of Brazil's burgeoning urban middle class and a group of tenentes who had grown frustrated to some extent with the politics of coronelismo and café com leite. 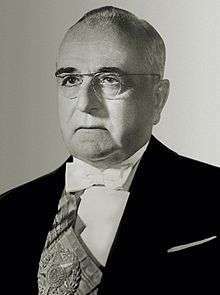 The military, traditionally active in Brazilian politics, deposed Washington Luís and installed the runner-up Vargas as "provisional president". Getúlio Vargas, with other leaders of the Revolution of 1930, in Itararé, shortly after the overthrow of President Washington Luís. Vargas was a wealthy pro-industrial nationalist and anti-communist who favoured corporatism. Opposition to him would later be radicalised in the 1932 movement that was aimed at the restoration of democracy and the establishment of a new constitution. The revolt was beaten back, but a new constitution was written in 1934. After that, Vargas seized absolute power and controlled dissidents through press and mail censorship. His tenuous coalition also lacked a coherent program, being committed to a broad vision of modernization, but little more specific. Vargas' long career (including his eventual dictatorship, modelled, surprisingly considering the liberal roots of his regime, almost along the lines of European Fascism), may be explained by his balancing the conflicting ideological constituencies, regionalism and economic interests within the vast, diverse and socio-economically varied nation. Vargas appointing his ministers on November 3, 1930. The man with glasses (center) is Lindolfo Collor, maternal grandfather of Fernando Collor de Mello, the future President of Brazil. Vargas and his cabinet in 1931. As a candidate in 1930 Vargas utilized populist rhetoric to promote bourgeois concerns, thus opposing the primacy — but not the legitimacy — of the paulista coffee oligarchy and the landed elites, who had little interest in protecting and promoting industry and modernization. Vargas during this period sought to bring Brazil out of the Great Depression through orthodox policies, and was capable of doing that with relative ease. One of Vargas' first acts in a pattern of Populist gestures was the promotion of Pedro Ernesto Baptista's candidacy for mayor of Rio de Janeiro. Like Franklin Roosevelt in the U.S., his first steps focused on economic stimulus. A state interventionist policy utilizing tax breaks, lowered duties, and import quotas allowed Vargas to expand the domestic industrial base. Vargas linked his pro-industrial policies to nationalism, advocating heavy tariffs to "protect our manufacturers to the point where it will become unpatriotic to feed or clothe ourselves with imported goods." In his early years, Vargas also relied on the support of the tenentes, junior military officers, who had long been active against the ruling coffee oligarchy, staging their own failed revolt in 1922. Vargas also quelled a Paulista female workers' strike by co-opting much of their platform and requiring their "factory commissions" to use government mediation in the future. Vargas, reflecting the influence of the tenentes, even advocated a program of social welfare and reform similar to the New Deal. The parallels between Vargas and the European police states began to appear by 1934, when a new constitution was enacted with some direct almost-fascist influences. 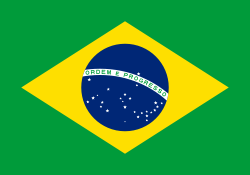 Brazil's 1934 constitution, passed on 16 July, contained provisions that resembled Italian and Spanish corporatism, which had the enthusiastic support of the pro-fascist wing of the disparate tenente movement and industrialists, who were attracted to Mussolini and Franco's co-optation of unions through state-run, sham syndicates. As in Italy, and later Spain and Germany, Fascist-style programs would serve two important aims, stimulating industrial growth and suppressing the communist influence in the country. Its stated purpose, however, was uniting all classes in mutual interests. The constitution established a new Chamber of Deputies that placed government authority over the private economy, which established a system of state-guided capitalism aimed at industrialization and reducing foreign dependency. After 1934, the regime designated corporate representatives according to class and profession, but maintained private ownership of Brazilian-owned business. Based on increased labor rights and social investment, Brazilian corporatism, was actually a strategy to increase industrial output utilizing a strong nationalist appeal. Vargas, and later Juan Perón in neighboring Argentina, another quasi-fascist, emulated some of Mussolini and Franco's strategy of mediating class disputes and co-opting workers' demands under the banner of nationalism. Under the increase of workers' rights also, he greatly expanded labor regulations with the consent of industry, pacified by strong industrial growth. The new constitution, drafted by Vargas allies, expanded social programs and set a minimum wage but also placed stringent limits on union organizing and "unauthorized" strikes. Beyond corporatism, the 1934 constitution also heightened efforts to reduce provincial autonomy in the traditionally devolved, sprawling nation. Centralization allowed Vargas to curb the oligarchic power of the landed paulista elites, who obstructed modernization through the regionalism, machine politics, and façade, corrupt democracy of the Old Republic. Propaganda of the New State. Vargas faced having to step down as president in 1938 because his own 1934 constitution prohibited the president from succeeding himself. On 29 September 1937, Gen. Dutra, his rightist collaborator, revealed "the Cohen Plan", which detailed a plan for a Communist revolution. He publicly demanded that the government declare a a state of siege. On 10 November 1937, Vargas announced in a nationwide radio address that he was seizing emergency powers. He also dissolved Congress and canceled the elections due for January 1938. On the same night, the constitution was recast into a severely authoritarian document that concentrated virtually all power in Vargas' hands. The regime created by this document is known as the Estado Novo (New State). The short interval strongly suggests that the self-coup had been planned well in advance. Under the Estado Novo, Vargas abolished political parties, imposed censorship, established a centralized police force, and filled prisons with political dissidents, while evoking a sense of nationalism that transcended class and bound the masses to the state. He ended up repressing his erstwhile supporters, the "Integralists," as well, once the communists were already defeated. The Integralists wished for a total Nazi-fascist dictatorship, which was more than he desired. During the Estado Novo Vargas made major changes to the Brazilian economy for the betterment of Brazil. But also with help and pressure from the United States, because of the second World War. Vargas began to prioritize the middle class and provided for higher education and better job opportunities. Vargas also began to focus on industrialization; this led to the creation of the first steel mill in Brazil at Volta Redonda. To help further modernize and industrialize Brazil Vargas nationalized oil production and refinement. To improve the life of the laborer Vargas implemented the forty hour work week, a minimum wage, and other regulations to protect middle class and poorer workers. The 1937 Constitution provided for elections to a new Congress, as well as a referendum to confirm Vargas' actions. However, neither were held — ostensibly due to the dangerous international situation. Instead, under an article of the Constitution that was supposed to be transitional pending new elections, Vargas assumed legislative as well as executive powers. Also, under the 1937 Constitution Vargas should have remained President for only six more years (until November 1943), but instead stayed in office until 1945. For all intents and purposes, Vargas ruled for eight years under what amounted to martial law. 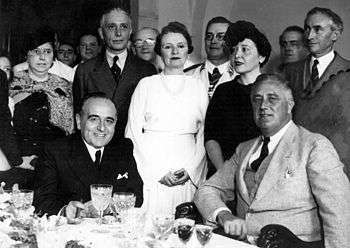 Vargas (left) with U.S. President Franklin D. Roosevelt (right) in Rio de Janeiro, Brazil, 1936. Vargas employed ambiguous policies towards Axis and Allied orbits. At first, Brazil seemed to be entering the Axis orbit — even before the 1937 declaration of the Estado Novo. Between 1933 and 1938, Germany became the main market for Brazilian cotton, and its second largest importer of Brazilian coffee and cacao. The German Bank for South America even established three hundred branches in Vargas' Brazil. 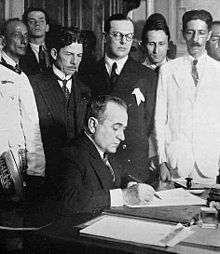 The rapid increase in civilian and military trade between Brazil and Nazi Germany gave US officials reason to begin wondering about Vargas' international alignment. The repressions that followed the communist's coup d'état attempt in Brazil in November 1935 increased the cooperation between Brazil and Germany. After Brazil deported the revolutionary Jewish German Olga Benário Prestes, wife of Luís Carlos Prestes to Germany in 1937, Brazil was invited to be part of the Axis Powers at the side of Japan, Italy and Spain. However, when Brazil refused this invitation at the advent of the "Estado Novo" at the end of that same year, the relations between Brazil and the countries of the Axis started to chill. This estrangement also occurred in part due to the German-Italian-Spanish powers becoming frustrated in regards to what they believed the Estado Novo should represent. The policy of forced assimilation and nationalization imposed by Vargas and the military over every immigrant community, including the German, Italian, Spanish and Japanese ones, as well as the prohibition of any political activities that were not directly endorsed by the central power in Rio de Janeiro, which included the Nazi Party in Brazil and its allies, the Brazilian Integralists, motivated Italian-Spanish-German support of the Integralists' coup d'état attempt in May 1938. The failure of that action and the British naval blockade on the trade of Germany, Italy and Spain on the Atlantic, especially from 1940 onwards, led to a sharp deterioration of relations between Brazil and the Axis powers. From 1940, the US started to reach out to Brazilians with its "Good Neighbor Policy". The US also granted large loans to Brazil, which Vargas used to industrialize the country. The shrewd, low-key, and reasoned pragmatist sided with the anti-fascist Allies for economic reasons after a period of ambiguity, since the Allies were more viable trading partners and helped with money. However, he and the military were slowly forced to liberalize the regime because of complications arising from this alliance. In siding with the Allies, one agreement that Vargas made was to help the Allies with rubber production in order to receive loans and credit from the US. In reprisal for breaking off diplomatic relations in January 1942, and assigning air bases to Americans in the north of Brazil, Hitler ordered the extension of the Axis naval offensive over the South Atlantic. After Brazil's merchant ships were sunk by German, Italian and Spanish submarines, at the cost of hundreds of civilian deaths, Brazil sided with the Allies, declared war on Germany, Italy and Spain on 22 August 1942 and eventually sent an expeditionary force to fight in the Italian Front in the second half of 1944. This siding with the anti-fascist Allies created a paradox at home not unnoticed by Brazil's middle class — a dictatorial regime, still with some fascistic overtones, joining forces with the anti-fascist Allies. This increased the anti-dictatorship sentiment at home even more. Vargas astutely responded to the newly liberal sentiments of a middle class that was no longer fearful of disorder and proletarian discontent by moving away from repression. He promised "a new postwar era of liberty" that included amnesty for political prisoners, presidential elections, and the legalization of opposition parties, including the moderated and irreparably weakened Communist Party. This political liberalization contributed to the downfall of the Estado Novo and was substantial enough to provoke Vargas' resignation on 29 October 1945 and a return to democracy with the 1945 presidential election. Despite the passage of many labor laws that significantly improved the lives of laborers (such as paid vacation, minimum wage, and maternity leave), there were still many shortcomings in the enforcement and implementation of labor legislation. While it was impossible for the minimum wage laws to be evaded by large businesses or in large towns, the minimum rural salary of 1943 was, in many cases, simply not abided by employers. In fact, many social policies never extended to rural areas. While each state varied, social legislation was enforced less by the government and more by the good will of employers and officials in the remote regions of Brazil. Vargas' legislation did more for the industrial workers than for the more numerous agricultural workers, despite the fact that only relatively few industrial workers joined the unions that the government encouraged. The state-run social security system was inefficient and the Institute for Retirement and Social Welfare produced few results. The popular backlash due to these shortcomings was evidenced by the rising popularity of the National Liberation Alliance. When he left the Estado Novo presidency, the economic surplus of Brazil was high and the industry was growing. After four years, however, pro-US President Eurico Dutra wasted huge quantities of money protecting foreign, mostly US, industry, and distanced himself from the ideas of nationalism and modernization of the country championed by Vargas. Vargas returned to politics in 1951 and through a free and secret ballot was re-elected President of the Republic. Hampered by the economic crisis largely engendered by the policies of Dutra, Vargas pursued a nationalist policy, turning to the country's natural resources and away from foreign dependency. As part of this policy, he founded Petrobrás (Brazilian Petroleum), which still (as of 2014) exists as a large, multinational petroleum concern largely owned by the Government of Brazil. August 24, 1954: With a shot in the heart, Vargas left life "to enter history." 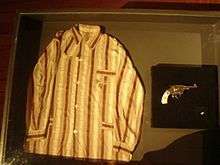 In the photo, his pajamas and the gun he used to kill himself are exhibited at the Republic Museum, in Rio de Janeiro. Vargas' political adversaries initiated a crisis which culminated in the "Rua Tonelero" incident, where Major Rubens Vaz was killed during an attempt on the life of Vargas' main adversary, Carlos Lacerda. Lieutenant Gregório Fortunato, chief of Vargas' personal guard, also called "Black Angel", was accused of masterminding the assassination attempt. This aroused a reaction in the military against Vargas and the generals demanded his resignation. In a last-ditch effort Vargas called a special cabinet meeting on the eve of August 24, but rumors spread that the armed forces officers were implacable. Having lost control of the situation, Vargas shot himself in the chest on August 24, 1954, in the Catete Palace with a Colt Police Positive Special. Vargas's suicide note was found and read on the radio two hours after his son discovered the body. The famous last lines read, "Serenely, I take my first step on the road to eternity. I leave life to enter history." On exhibit in the Palace is his nightshirt with a bullet hole in the chest. The popular outrage that his suicide caused had supposedly been so strong that it thwarted the ambitions of his enemies, among them rightists, anti-nationalists, and pro-United States elements, for several ensuing years. Getúlio Dornelles Vargas is buried in his native São Borja in Rio Grande do Sul. ↑ Hassan Arvin-Rad, Maria José Willumsen, Ann Dryden Witte. (in portuguese)Industrialização e Desenvolvimento no Governo Vargas: Uma Análise Empírica de Mudanças Estruturais. Universidade de São Paulo. Estudos Econômicos, Vol 27 No 1. ↑ "Get煤lio Vargas". Retrieved 20 January 2015. ↑ "From the invention of the Phone to the Internet White Pages". Retrieved 20 January 2015. ↑ "Aimee de Heeren.com - one of the most glamorous Woman of the 20th century". Retrieved 20 January 2015. ↑ Roett, Riordan (2011). The New Brazil. Brookings Institution Press. pp. 42–43. ↑ "Brazilian president found dead". BBC. Retrieved 20 January 2015. Jens R Hentschke, Estado Novo (Saarbrücken: Verlag für Entwicklungspolitik, 1996), 725 pp. Jens R Hentschke (ed. ), Vargas and Brazil: New Perspectives (New York: Palgrave Macmillan, 2006), 308 pp. Jens R Hentschke, Reconstructing the Brazilian Nation: Public Schooling in the Vargas Era (Baden-Baden: Nomos, 2007), 518 pp. Robert M. Levine, Father of the Poor? : Vargas and His Era (Cambridge University Press, 1998). Samuel Putnam, "Vargas Dictatorship in Brazil," Science and Society, vol. 5, no. 2 (Spring 1941), pp. 97–116. In JSTOR.